Today we’re having a family lunch at Jonkershuis, in Cape Town’s Constantia valley. Jonkershuis is set overlooking vineyards and mountains with a beautiful outdoor area reminiscent of the boulevards of France. There’s also a lovely indoor courtyard which is the perfect sun trap and offers protection on a windy Cape Town day. The menu offers something for everyone, with a range of tasty salads and a fish, pork, beef and venison selection. 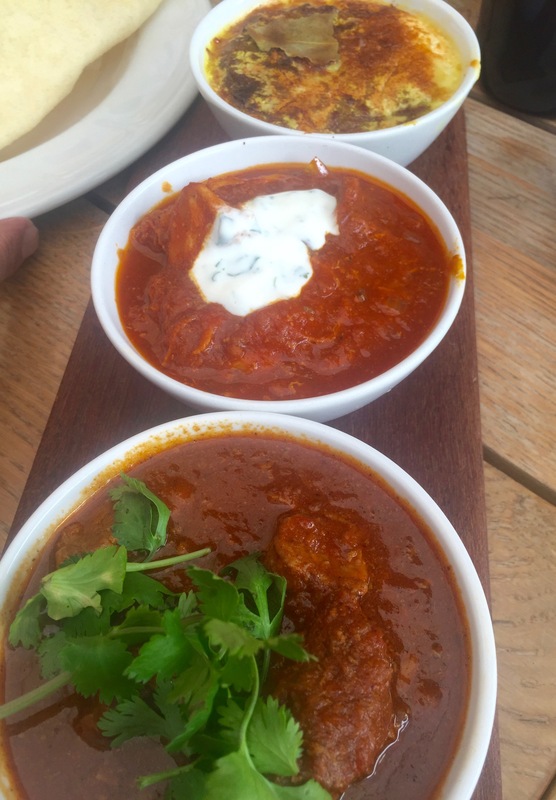 And Cape Malay dishes – which for me has got to be the way to go every time. Cape Malay cuisine is a fusion of South African and Asian influences. When the Dutch colonised the Cape in the 1600s and 1700s, they brought people from the East to work as slaves. They came mainly from Indonesia which was a Dutch colony for several centuries. Cape Town’s attractively colourful Cape Malay Quarter is on the slopes of Signal Hill and called the Bo-Kaap. Worth a visit if you’re in town. Adaptations of traditional Cape Malay dishes like bredie, bobotie, sosaties and koeksisters are now staples in many South African homes – in fact I’ve even made my own versions. 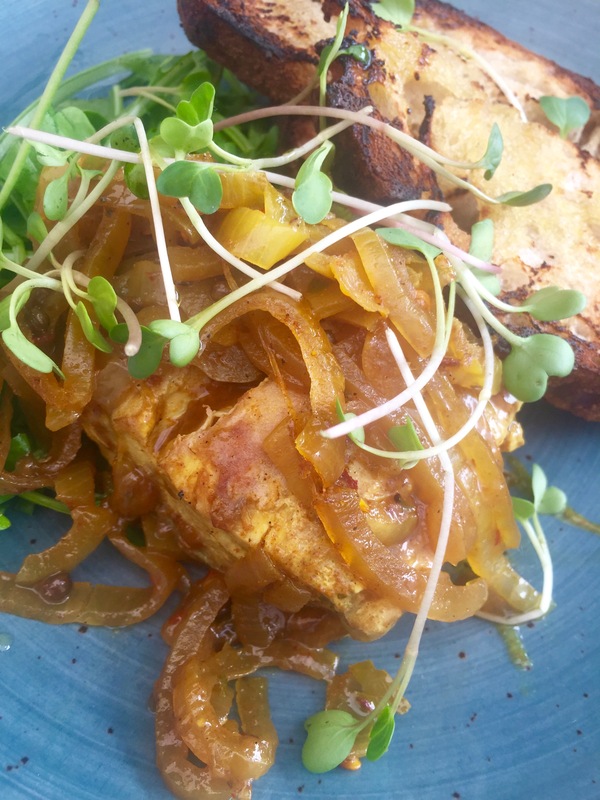 You can find my recipe for bobotie by clicking here – do try it out and let me know what you think. You will also find European and Indian influences. The dishes are characterised by the wide use of spices, producing full-bodied flavours – though not a lot of chilli. Seafood is a big favourite (well there’s plenty around) and fish dishes are usually salted, curried or pickled. Chutneys and atchars also play a role – gotta have a good sambal selection, after all. Today there was pickled fish on the specials board. I can’t tell you how many people pull a face when I say I love pickled fish…well, they are wrong, it’s simply delicious. Fish fillets are marinated in vinegar and spices including curry powder, turmeric, ginger and coriander with plenty of soft onions. The dish is served cold – perfect with salad – and the process produces the plumpest of fish fillets and wonderful flavours. Ordering dilemmas rule my restaurant-going life and today was a big one. The fabulous Estate Tasting Plate is a must-have at Jonkershuis – it’s a large offering and for me can’t be enjoyed to the full on top of a starter. And today there were two starters I wanted to sample. So a quick bit of negotiation and I got my husband to agree that I could have a taster of his Tasting Plate. As a result I can taste everything my heart desires today. My second starter on order then. 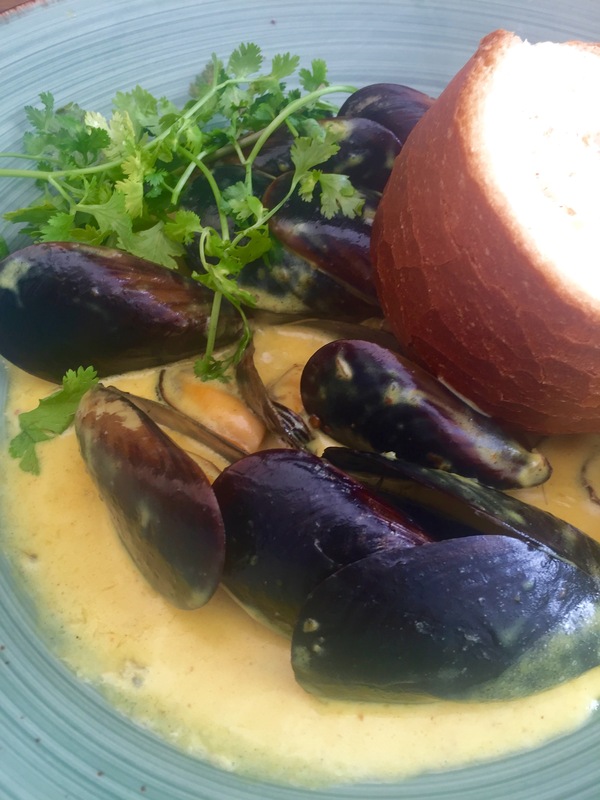 Local black mussels in spicy masala and mango cream served with coriander and a baguette. I’ve eaten a lot of mussels this summer in Cape Town and very good they’ve been too. Today’s sauce was fabulous, creamy, sweet and spicy and the beautiful baguette, as soft as cloud inside was just what I needed to mop everything up. The appearance of the Estate Tasting Plate evokes order envy in everyone! 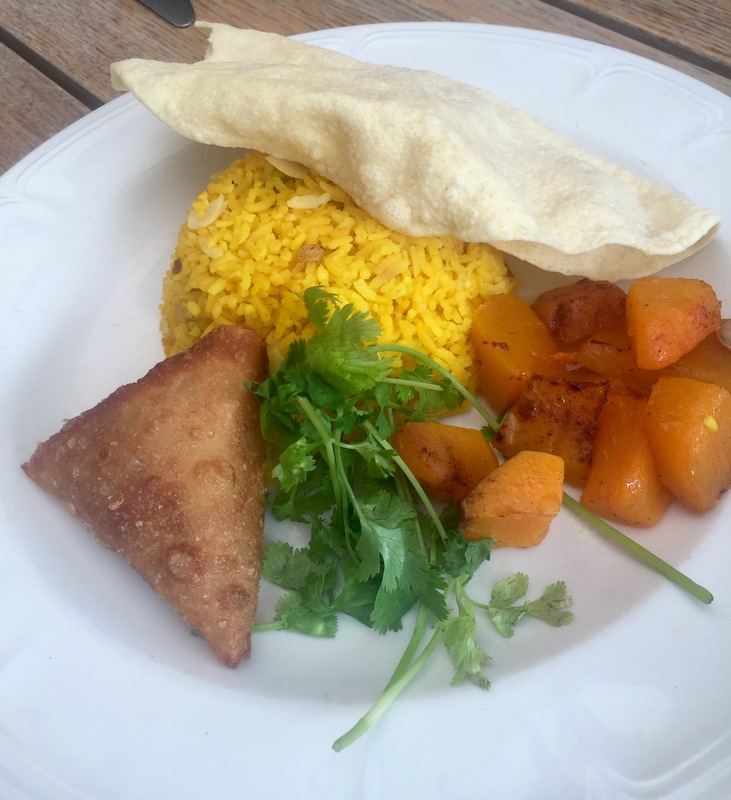 First of all, the plate of what are basically your accompaniments to the main event – sultana and almond turmeric rice, oven-baked cinnamon butternut, a quick fried poppadum and an angry beef samosa. And then the meaty selection. Oven-baked bobotie, Karoo lamb curry and chicken breast curry. You see, anyone would have to be envious of this order. 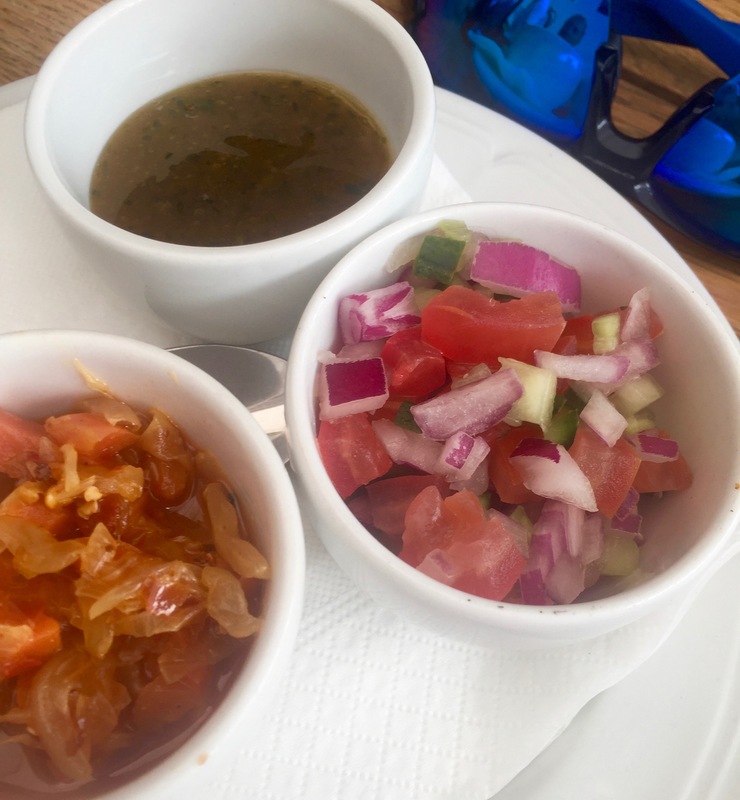 Also there’s the selection of house sambals – sweet tomato salsa, apricot chutney and spicy vegetable atchar. If you’ve never been to Jonkershuis, you really should go – and take my advice – don’t even look at the menu, just go straight for the Estate Tasting Plate – you’re gonna love it. Especially relevant if you’re seeking a good selection of Cape Malay cuisine in one hit. 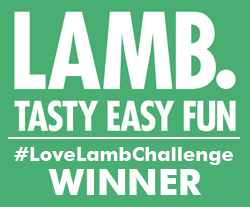 Finally, I can’t leave you without today’s autocorrect challenge – my system doesn’t like sambals and keeps trying to insist I change it to samba! Starters range from R62-R98 (£3.70 to £5.80 at today’s exchange rate). The Estate Tasting Plate is R188 (£11 at today’s exchange rate). Jonkershuis is at Groot Constantia Wine Estate, Groot Constantia Road, Constantia, Cape Town.